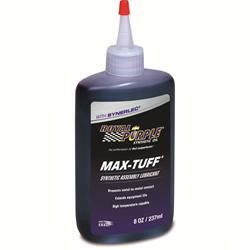 Royal Purple Max-Tuff synthetic assembly lube utilizes unique synthetic molecules that adhere tenaciously to metal surfaces to create a formidable load-bearing physical barrier between surfaces. This minimizes the possibility of boundary conditions, while providing excellent protection to both ferrous and non-ferrous metals against rust and corrosion. It is an ultra-tough synthetic lubricant designed for use in reassembling repaired equipment. used about 1/3 or a bottle to do a whole Ford smallblock engine build. sticks to stuff pretty well. Excess will run and drip, but leaves a good coating. I use this on every engine build. This stuff is aawesome would recommend to everyone. This stuff is great. Sticky but not too thick. Great stuff always recommend the " purple stuff" used it in all my builds. Never lets u down.